Tis the season of giving and I'm starting early with this baby set. One of my brother's closest friends in London gave birth to a baby boy early this November and I'm shipping this out to them to keep the lil' man warm during those cold London nights. 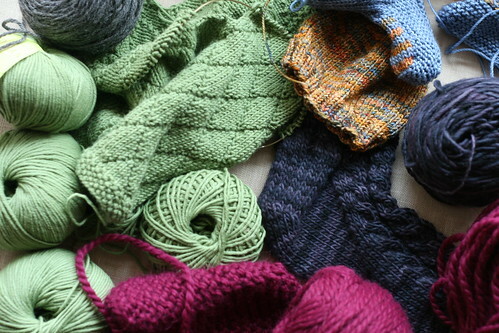 When I started knitting my brother had long since moved over the pond and only came home every so often. During one of his first trips home he was with a co-worker who immediately fell in love with one of my first knitted hats. Her enthusiasm surprised and flattered me so much so that I gifted her that hat (an Odessa!) on the spot. She was one of the first people that made me feel like what I was doing was a fabulous thing. I had a chance to see her and her pregnant belly this summer at my brother's wedding. You could tell that she couldn't wait to meet her lil' man. Now that he's here I couldn't wait to make him something. 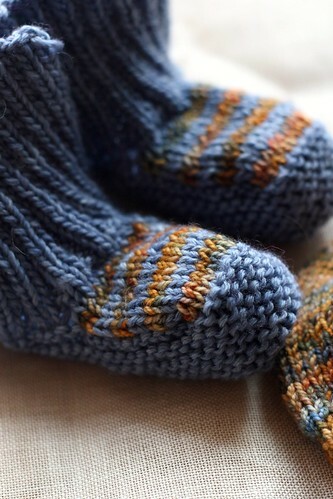 The booties are the Docker pattern from the Rowan Babies book which is currently out of print. It's one of the more popular bootie patterns at my LYS as it's easy to make and baby tested and approved! The hat is copied from a baby hat that Patricia made her daughter, Grace. 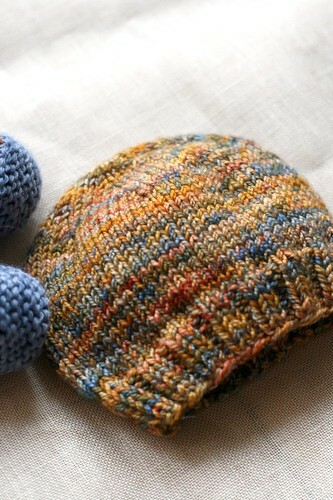 A simple little beanie using two strands of KPPPM held together. The pattern was pretty much improvised. Raveled here. Wow, I love the look of your WIP-losion! 🙂 And I think I sneak a pattern I’ve been wanting to make for the longest time – the Jasper Diamond Hoodie. Great colour! What a lucky baby to get such lovely booties and hat. such a great little baby set!! Wow! Keeping busy! 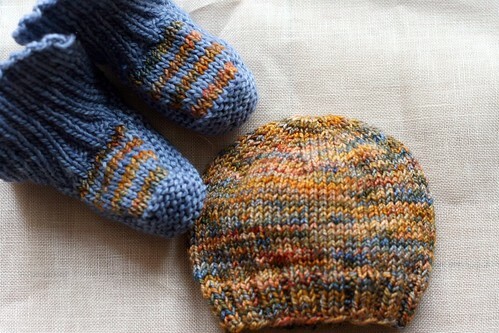 The little beanie and booties are super cute! Adorbs baby knits! Such a perfect gift! As we start to understand why trial and error is so painful a process, we may be able to use it more constructively. I think I sneak a pattern I’ve been wanting to make for the longest time – the Jasper Diamond Hoodie.